Hurricanes Harvey and Irma would not be as intense without warmer atmospheric and oceanic conditions. Nor, for that matter, would Jose and Katia. Science knows this. It is not theory; it is not speculation. We don’t need statistical models to prove this statement. If Atlantic basin climate conditions at the site of these storms were cooler, the storms would carry less water. In particular, the massive confluence of heat, wind and water, in such a short time, in this one region, is without precedent. There is no moment in the historical record where more rain has fallen in one place in the US than during Harvey. So much rain fell the storm was able to feed off its own floodwaters. Irma is the most powerful storm ever recorded in the Atlantic. Its well-defined cyclone, sustained Category 5 winds, and long string of repeated landfalls, all set it apart. Irma, Jose, and Katia, mark the first time on record when three hurricanes made landfall simultaneously in the region. 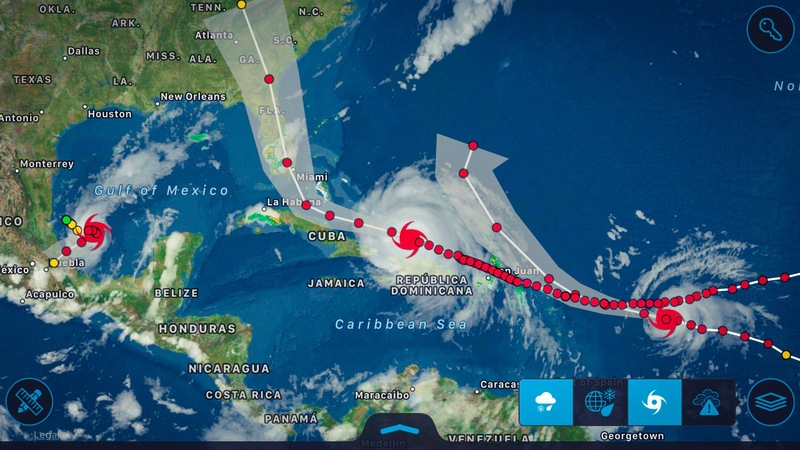 Screenshot from Wunderground Storm app, on September 7, showing historic trio of hurricanes Irma, José, and Katia, threatening land simultaneously. There is a lot of hand-wringing about the right way to state the simple scientific fact that is the effect of excess thermal energy on tropical cyclones. One common caveat is some variation of: “While we cannot attribute an individual storm to climate change…” The caveat has become so commonplace, what it refers to is now called the attribution problem. But there is a fundamental miscommunication at work in this phrasing. A tropical disturbance—one or more thunderstorms coming together—begins to move over open ocean. A tropical depression forms, when a tropical disturbance combines with warm temperatures, open water, and other weather systems, centered on a core of low pressure. The cyclonic spin starts at this stage, as warm water rises and low pressure pulls in weather systems, creating higher-speed winds and a tighter spin. A tropical storm designation comes when the speed of winds caused by the weather pulled in by the low pressure sustain speeds above 39 mph. A hurricane forms when a tropical storm passes over very warm water, core pressure falls further, and resulting wind speeds reach 74 mph or higher. At these speeds a defined “eye” forms at the center, and the cyclonic spin is reinforced, making the storm more defined and harder for other systems to pull apart. Warm air and water make hurricanes. Warmer air and water “fuel” bigger hurricanes, by putting more warmth and water in the right place at the right time. If a tropical depression forms, and conditions prove favorable to grow into a Hurricane, warmer seas can increase the power of a storm primarily through evaporation of the hot seawater and other processes. When conditions get too hot in the tropics, the ocean tends to shed that excess heat away from the tropical surface ocean as fast as possible. we know that the strongest storms are getting stronger, with roughly eight meters per second increase in wind speed per degree Celsius of warming. And so it is not likely to be a coincidence that almost all of the strongest hurricanes on record (as measured by sustained wind speeds) for the globe, the Northern Hemisphere, the Southern Hemisphere, the Pacific, and now, with Irma, in the open Atlantic, have occurred over the past two years. As temperatures of both ocean and atmosphere continue to warm, across the world, and sea levels continue to rise, the problem of self-feeding major cyclones will become more common. That means urban planners in coastal areas should expect far more serious impacts, even from lower intensity cyclones. Weather is the movement of matter and energy through Earth’s atmosphere and ocean. The climate system is the overall combined system made up of ocean, atmosphere, and the movement of matter and energy between them, over time. Thermal energy is a driving force throughout the Earth’s climate system. Emission of heat-trapping compounds means both atmosphere and ocean will absorb more thermal energy. Make no mistake: warming makes storms stronger. Harvey and Irma are sad reminders that policy matters. At a time when damage from climate change is escalating, we need sensible policy in Washington to protect the citizens of this country, both by reducing future climate change and preparing for its consequences. We should demand better of our leaders. Resilience of all kinds requires that we understand the science, build and share knowledge, and rethink our design of economic and industrial standards. Intelligent future investment means learning how to avoid risk, build resilience, reduce the volume of climate-forcing compounds emitted by human activity to below net zero, and value natural systems as irreplaceable ecosystemic market underpinnings (EMU). Natural efficiencies have the special value added which is their zero cost for maximal complex optimization—they provide more value than we could achieve through technology, and at zero up-front cost. Learning to maintain a healthy relationship with natural systems means more resilient EMU value, and far greater future potential prosperity. We can no longer afford the luxury of pretending that learning to do better is a cost instead of a benefit. The featured image at the top of the page is from NOAA’s GOES system and shows Hurricane Irma in the center, with Hurricane José approaching the Caribbean on the right, and Hurricane Katia hitting the coast of Mexico, on the left.